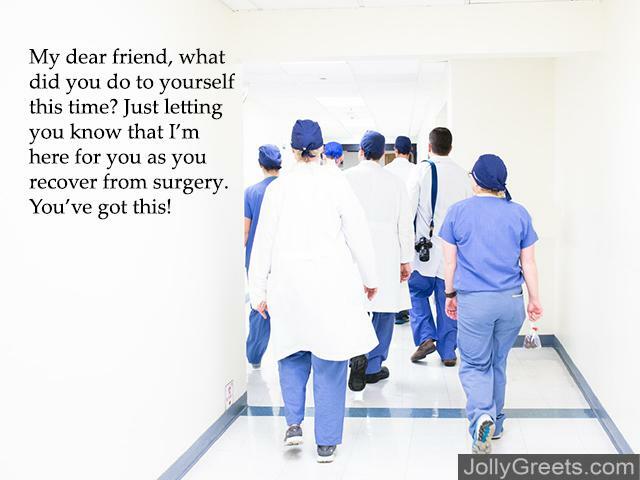 A thoughtful message goes a long way when a friend, family member, or coworker has to undergo surgery. Surgery is often a stressful and uncomfortable experience, so letting them know that you care and are willing to offer support is a lovely gesture. Your sweet get well wishes after surgery don’t have to be long, elaborate, or exceptionally clever; the simple act of sending your thoughts to your loved one in this time of discomfort is sure to brighten their day. Below, you’ll find a large selection of funny, meaningful, sweet, and memorable get well wishes for after surgery. Surgery can be a painful time for many, but a caring message is sure to ease the distress of your friend or family member. My dear friend, what did you do to yourself this time? Just letting you know that I’m here for you as you recover from surgery. You’ve got this! I know that there are many things you’d rather be doing than having surgery. But just think: this is getting you time off from work! Get well soon my friend, wishing you a very speedy recovery. Surgery is no laughing matter, but I can’t wait to have you back so that we can start laughing together again. Missing you, feel well soon! I’m thrilled to know that you’re recovering well from your surgery. Now come on, hurry back home so we can start having fun again! I know you must be tired from your recent surgery, but is it too soon for a recovery party? Get well soon my friend, you’re greatly missed! My dear, we are all itching to have you back (just don’t itch that scar, okay?). Wishing you the speediest of recoveries! 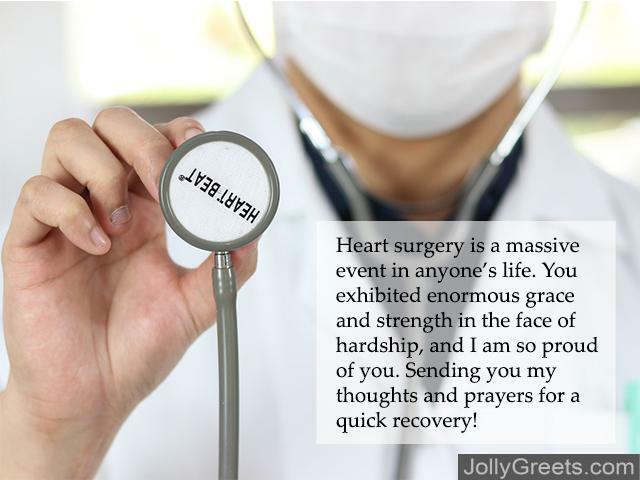 I am relieved and overjoyed to hear that you are recovering well from your recent heart surgery. You have been greatly missed during your time at the hospital and I can’t wait to see you soon. Sending you my thoughts and prayers for a quick recovery! Your strength and bravery are immeasurable, my friend. I am so proud of you for facing heart surgery with such courage. Wishing you a fast and painless recovery, I can’t wait to see you soon! Heart surgery is a massive event in anyone’s life. You exhibited enormous grace and strength in the face of hardship, and I am so proud of you. Sending you my thoughts and prayers for a quick recovery! There is nothing that you cannot endure, my dear friend. I’m ecstatic to hear that you are in great shape after your recent heart surgery. Sending you my thoughts and wishes for a speedy recovery, I’m so excited to see you soon! Your courage and strength in the face of heart surgery are endlessly inspiring to me. I’m so happy to hear that you’re on the road to a speedy recovery! Wishing you all the best during this time in your life. Surgery is undoubtedly a daunting event in anyone’s life. But, with your strength, resilience, and bravery, I know that you’ll have the speediest of recoveries. Sending you all my love, know that I am here for you! Wishing you all the best for your upcoming surgery. May you have a quick recovery so that you can return to the many things you love in life. The date of your surgery is drawing nearer, and I know you will handle this trying event with grace and courage. I’m sending you my thoughts and prayers for a quick, easy recovery! May you, with your surgery coming up, draw strength from the many, many people who love you. I am here for you, no matter what you need, during this difficult time. Wishing you comfort as you embark on the road to a speedy recovery! Sending you my thoughts and prayers for your upcoming surgery. With your strength, I know that the road to recovery will be quick–you can bounce back from anything, my friend! Sending you all of my love after your recent knee surgery. Surgery is no small event, but I am confident that your road to recovery will be a quick one. Be well, my friend! Wishing you all the best after your knee surgery! You are so strong and handled this stressful event with remarkable ease. After your recent knee surgery, I’m sending you thoughts and prayers for a speedy recovery. Your strength and calmness in the face of discomfort are incredible! My dear friend, I am filled with happiness to hear that you’re on the road to a quick recovery after your recent knee surgery. May you get plenty of rest and enjoy the support of loved ones in the coming weeks. My love, I’m overjoyed with the success of your knee surgery. Here’s to the speediest of recoveries and getting back to the life you love! Surgery is a difficult life event. But, the stress of a major surgery may be eased with the support of friends, family, and loved ones. When an important person in your life undergoes surgery, make sure they know that you care by sending them your thoughts in a meaningful message. The get well wishes listed above may all be used to express that you care after a major surgery.